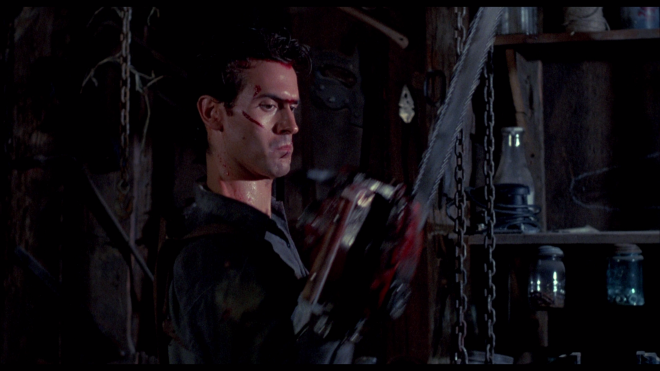 With a better budget and more proficient production, Sam Raimi returns to the creepy, haunted cabin in the woods with Evil Dead II, further exploiting the macabre funhouse appeal of the first movie while also solidifying Bruce Campbell's Ash Williams as a horror icon. Over 30 years later, we revisit the classic horror comedy on 4K Ultra HD with a gorgeous Dolby Vision HDR presentation, a satisfying DTS-HD MA soundtrack and a new documentary that will tempt devoted loyal fans. The overall UHD package is Recommended! 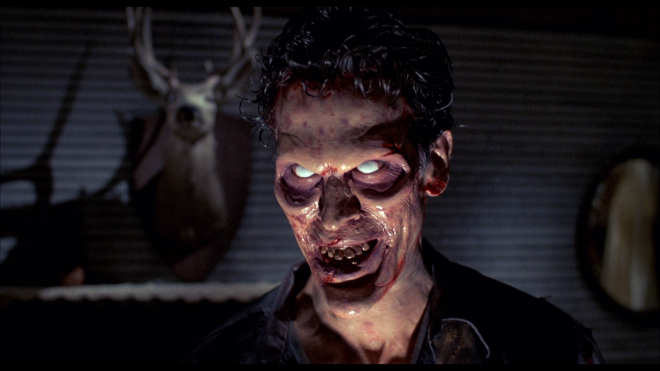 After the disastrous — though still weirdly amusing — Crimewave proved an embarrassing box office flop, Sam Raimi returned to the small, independently-financed horror flick that brought him recognition: The Evil Dead. Though he never really intended to do a sequel, the pleas from fans, and a nice sum of money from Dino De Laurentiis's DEG production company, finally convinced him to develop another creepy tale set in the mysterious backwoods cabin. The result is a continuation of Raimi's funhouse approach to gory horror, essentially exposing the exaggerated absurdity and nonsense within the genre. The original script idea was to pick up where the first film left off and saw our inadvertent hero Ash Williams (Bruce Campbell in his obviously most memorable role) time-traveling to the middle ages. For budgetary reasons, the wacky concept was soon tossed, but of course, later revisited for the third installment in the series. 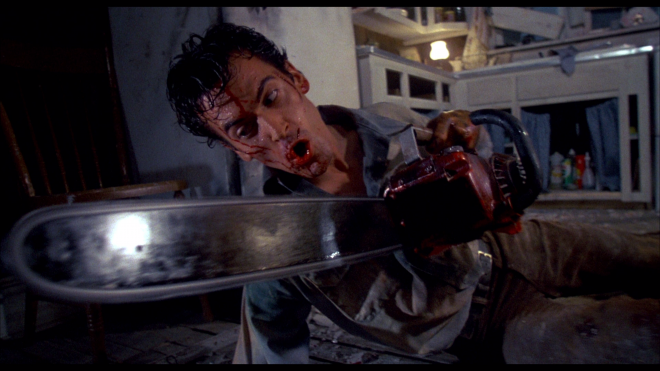 In a strange stroke of genius, Raimi, along with Scott Spiegel, instead came up with an ever-wackier script, one which not only provides a follow-up story but also serves as a logical bridge leading into Army of Darkness. It's a move rarely seen in films and television, where the continuity of a storyline is altered to create a new one — as in the Star Trek universe and most recently in J.J. Abrams's 2009 reboot. 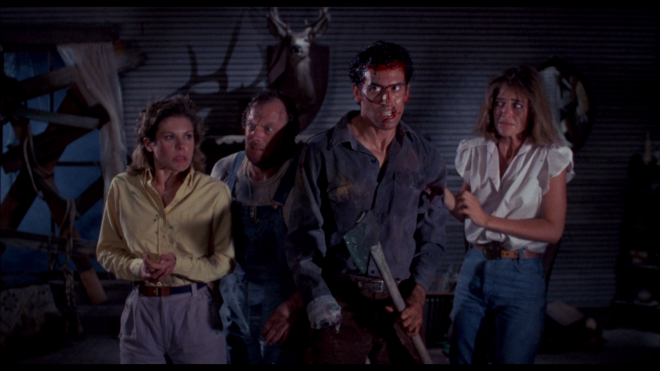 Such changes are often referred to as retroactive continuity, and it's the primary reason Evil Dead II cannot and should not be seen as a remake — a common mistake made by many viewers of this movie. In the series' Companion book, Sam Raimi explains that obtaining the rights to the first movie for a quick intro was considered too much of an effort. So, he decided to reshoot and condense the events with only Ash and his girlfriend Linda (Denise Bixler) going to the cabin, awakening the unseen evil force and fighting off malicious, taunting demons. Essentially, the first few minutes of exposition are simply a slightly different take on part one and provides the basic groundwork from which the sequel logically works. Evil Dead II actually picks up moments after Linda is buried and Ash is violently hurled through the air by the evil force, crashing into a tree and being momentarily possessed. The next day sees him trying to survive a second night at the cabin, all the while introducing audiences to a new cast of characters caught in this alternate storyline. This time, the Book of the Dead was discovered by an archeology professor, who recites passages from it onto a large tape recorder. When Ash listens to the incantation, he unwittingly unleashes a horde of malevolent spirits. Annie (Sarah Berry), the professor's daughter, and her boyfriend (Richard Domeier) show up with a hillbilly couple (Kassie Wesley and Danny Hicks) serving as another element of comic relief. In fact, changing the storyline's continuity also provides Raimi the freedom to really play up the slapstick aspect of his madcap creation, transforming the series into more of a comedy horror. 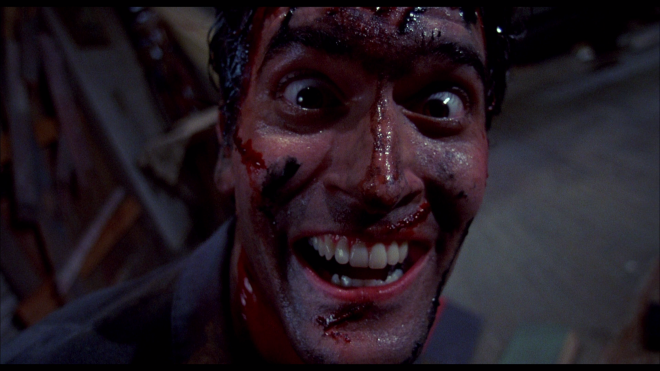 While still somewhat scary, much like its predecessor, Evil Dead II can never really be taken seriously as a straight terror flick. It's a terrifically entertaining movie, to be sure, but the whole exploit is so over the top silly with a ridiculously excessive emphasis on the gore that one just has to laugh instead of cringe from fright. This is made quite evident in the sight-gags meant as an homage to The Three Stooges and the stop-motion animation action sequences that bring to mind the movies of Ray Harryhausen. And more importantly, this hilarious sequel paves the way for an equally uproarious third installment, featuring Sam Raimi's original story idea of Ash Williams battling the undead in the Middle Ages. 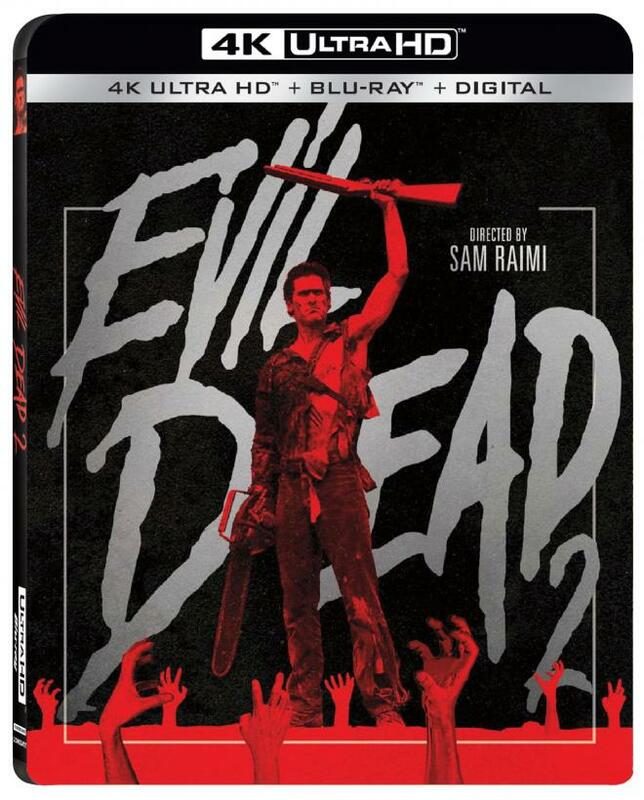 Lionsgate Home Entertainment brings Evil Dead II to 4K Ultra HD Blu-ray as a two-disc combo pack with a flyer for a Digital HD Copy, giving owners access only to the 1080p version with legacy Dolby Digital 5.1 audio. The dual-layered UHD66 disc sits comfortably opposite a Region A locked, BD50 disc inside a black, eco-cutout case with a glossy slipcover. The aforementioned Blu-ray appears to be the same 2011 25th Anniversary release with the same set of supplements, but it includes bonus material from the European Special Edition. At startup, the disc goes straight to an animated menu screen with a still photo of the cover art, options along the bottom and music playing in the background. Ash Williams revisits the Ultra HD cabin of his nightmares with a shockingly beautiful and exceptional HEVC H.265 encode that will have devoted, loyal fans locking the previous two Blu-ray releases in the cellar with the Possessed Henrietta. Presumably coming from the same 4K remaster done by StudioCanal earlier this year for their European release, the 2160p transfer is remarkably sharper with far better detailing in the clothing, the surrounding foliage and throughout the cabin. In fact, viewers can now better make out minor scratches, defects and small imperfections in the aged wooden floors, the battered walls, the furniture and the random objects decorating the background. Lifelike facial complexions are highly-revealing and individual hairs are distinct, but best of all is seeing that the makeup and special effects have held up extraordinarily well. On the other hand, the movie comes with a fair amount of blurry, soft segments, which are related to the condition of the source and the original photography. There are also minor instances of negligible aliasing along the sharpest edges and very mild moiré patterns. Nevertheless, the picture quality is stunning and highly-detailed for a majority of the runtime. The 4K video also brings the laughs and gores with notably improved contrast and brightness, making the silly, blood-soaked revelry really pop and feel as though watching it for the first time on the big screen. The ridiculously goofy carnage displays intensely brilliant whites, giving light fixtures a splendid but tight glow while the climactic finish flashes with enthusiastically bright bursts that'll have some squinting at the screen. Specular highlights may not be as drastic or striking, but nevertheless, metallic objects come with a realistic shine and glimmer. Also, there is better visible detailing within the hottest spots while wet, blood-stained surfaces, such as the various weapons used, and the makeup come with a dazzling twinkle. Black levels are significantly richer with a silkier inkiness in various articles of clothing and hair. Since most of the movie takes place at night, the 1.85:1 image is continuously showered in velvety, raven shadows, providing a lovely, three-dimensional cinematic quality during some of the presentation's best moments. Ash fights the deadites packing the same DTS-HD MA 5.1 soundtrack enjoyed on the Blu-ray, which is a good thing even though a new object-based track might have been interesting. In either case, this lossless mix remains a strong audio presentation with a sharp and expansive mid-range, delivering excellent clarity in the upper frequencies and during the loudest segments. This produces an awesomely broad and highly-engaging soundstage with distinct, well-prioritized dialogue reproduction and a potent, terrifically responsive low-end. When applying the receivers' Dolby Surround or DTS: Neural:X up-mixing functionality, the rears are employed to brilliant effectiveness, not so much in that atmospherics travel to the overheads because they really don't. Instead, the mix enjoys better, impressive directionality, as effects fluidly pan throughout the room to create a more satisfying, enveloping soundfield. The best moment demonstrating this starts at around the 47-minute mark when random noises bounce all around the cabin. A commentary track is shared between the UHD and the BD, but the UHD features one brand-new bonus while the accompanying Blu-ray ports over the same set of supplements as the 2013 StudioCanal European release and the 2011 25th Anniversary Edition. Audio Commentary: This hilarious conversation features Bruce Campbell, director Sam Raimi, make-up effects wizard Greg Nicotero and co-writer Scott Spiegel. This is simply one of the best commentaries around because the four men have such an amazing, easy-going camaraderie that we can't help but feel we're part of the gang joining the fun. Campbell does most of the talking, which consists of funny remarks and jabs at everyone else, especially Raimi, but at the same time, the group does great at dissecting the movie and offering lots of insightful anecdotes surrounding the production. This is not only for fans. The track is an awesome listen for all! Bloody and Groovy, Baby! (HD, 53 min): Produced by StudioCanal in 2018, the documentary is an entertaining tribute to Sam Raimi and Evil Dead 2. Pieced together from recent interviews with Guillermo del Toro, Roger Corman, Edgar Wright, Marcus Nispel and many other filmmakers and writers, each participant reminiscences on the first time watching the movie, share their thoughts on the production and even analyze the film's lasting impact. Swallowed Souls (HD, 98 min): Broken into seven pieces that can be watched separately or sequentially, each looks at various aspects of the production, and they feature cast & crew interviews reminiscing on their participation and share thoughts on its lasting impact. Cabin Fever (SD, 30 min): From special make-up effects creator Greg Nicotero's personal video library, these five segments are recordings during the creation, prep and shooting of the creature work and other make-up monstrosities, finishing with some deleted footage. Road to Wadesboro (HD, 8 min): Filmmaker Tony Elwood, who also worked on the production, takes viewers on a tour of various shooting locations. Behind the Screams (SD, 17 min): Narrated by Tom Sullivan, who worked in the special effects department, this featurette is essentially an assortment of stills of the creature and make-up work done in the movie. It's interesting stuff, but not wholly exciting. The Gore, the Merrier (SD, 32 min): A much better short doc about the production from the point of view of the special effects crew: Howard Berger, Robert Kurtzman and Greg Nicotero. While offering some praise to Sam Raimi, Bruce Campbell and Mark Shostrom, it's an enjoyable piece from three men with very fond memories of working on the film. Trailers (HD, SD): Along with the original theatrical preview, the disc concludes with a series of trailers from the Lionsgate catalog. Over 30 years ago, Sam Raimi broke new ground with Evil Dead II by further exploiting the macabre funhouse appeal of the first movie. The genius of this cult classic is the way in which it subconsciously reveals the ultimately silly and over-the-top nature of the horror genre. To this day, it continues to please and maintains an incredibly devoted fanbase. Raimi and chin-tacular legend Bruce Campbell revisit the creepy, haunted cabin in the woods on 4K Ultra HD with another gorgeous Dolby Vision HDR presentation that easily bests its Blu-ray counterpart and the same satisfying DTS-HD MA soundtrack. Adding one brand-new documentary along with the same set of supplements as before, the overall UHD package is recommended for everyone, but it's a must-own for devoted loyalists!